While I was in school at The Creative Circus, I had to find a way to keep the lights on. I worked at a shorts store. We had to leave closing notes in our Slack page, and through my quick wit and on-brand voice, I was soon brought on to be a remote copywriter for the company. A.K.A., my first real advertising job. One of the major things I did was help drive views to our Facebook videos. The marketing team would reach out to us, the remote writers, to help create headlines based on the video’s content. We use the carousel feature on Facebook to show a quick look at the shorts. I never thought I would find a practical use for emojis while selling shorts. 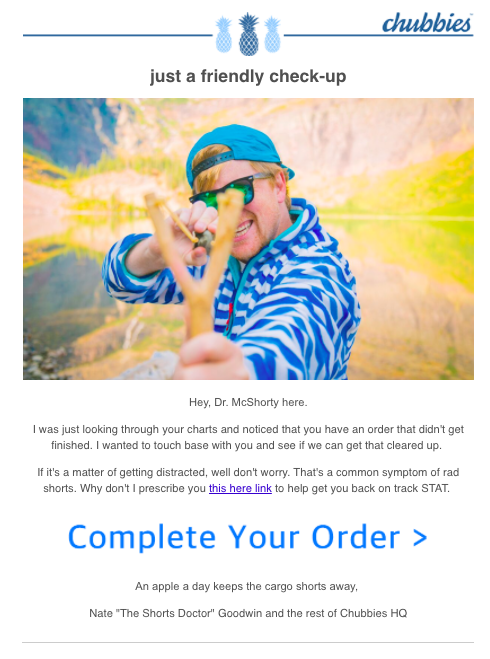 The Chubbies App uses push notifications to drive traffic. Unlike other apps, our notifications are actually entertaining. I was asked to help revamp the email campaign for customers who either left something in their cart, didn't finish checking out, or anything that could go wrong with their check out process. Here's a little taste. You don't work for a clothing company without getting a chance to model.